Endeca 11.x : How to Add manipulator using CAS? How to enable SEO urls in ATG/Endeca Integration? How to Remove a deployed Endeca application? Endeca SEO : How to enable Url Canonicalization? How to Migrate Endeca Application between environment for forge-based Indexing? As part of the development/debugging phase, Endeca Application needs to be migrated from QA to UAT or Production to Staging. Following items need to be migrated between environments. Find out the description below for each item. State File - State file contains Endeca auto generated dimension values and FCM generated dimension value. 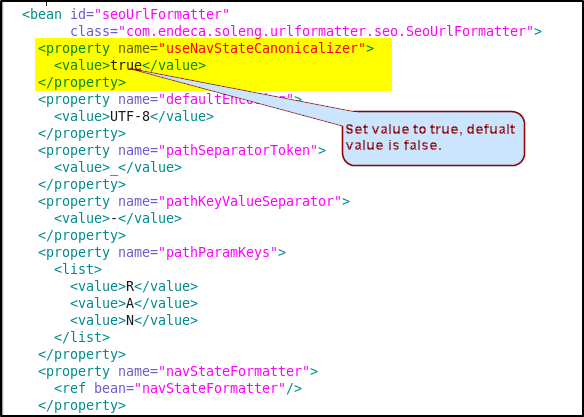 Endeca N-value can be different if state files do not get copied to the environment. 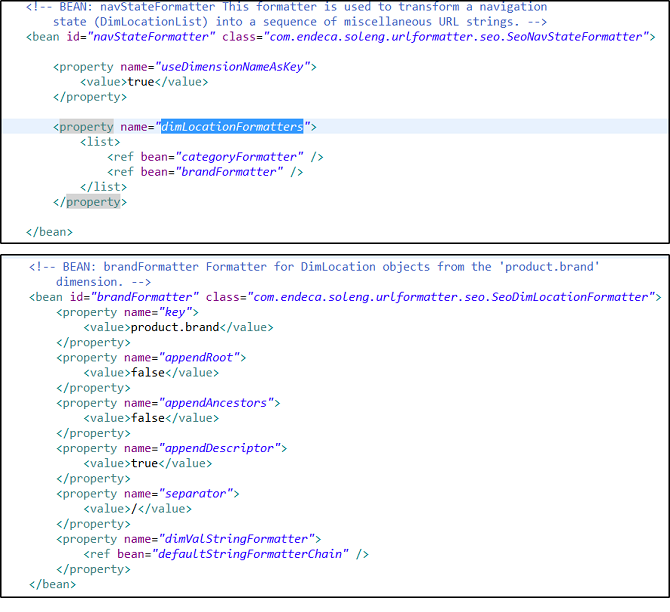 Endeca Pipeline - This Folder contains Endeca Application indexing configuration XML including properties, dimensions, search etc. Cartridge Templates - This folder contains all cartridge templates that is used to create content in Experience Manager. Editors Config - This Folder contains configuration file to make a call to MDEX to show appropriate data in Experience manager cartridges. Record Store - Record store contains all indexable records(Product catalog, content, record store etc.) and dimension information. As part of the migration process, the application needs to be exported first and the same set of files can be used to import into another environment. 2. State files - Copy <<Endeca_App>>/data/state folder. 4. Cartridge Templates - Copy <<Endeca_App>>/config/cartridge_templates folder. Import Endeca Application steps - Steps should be in the following order. 1. Record Store - Click here to get more details. 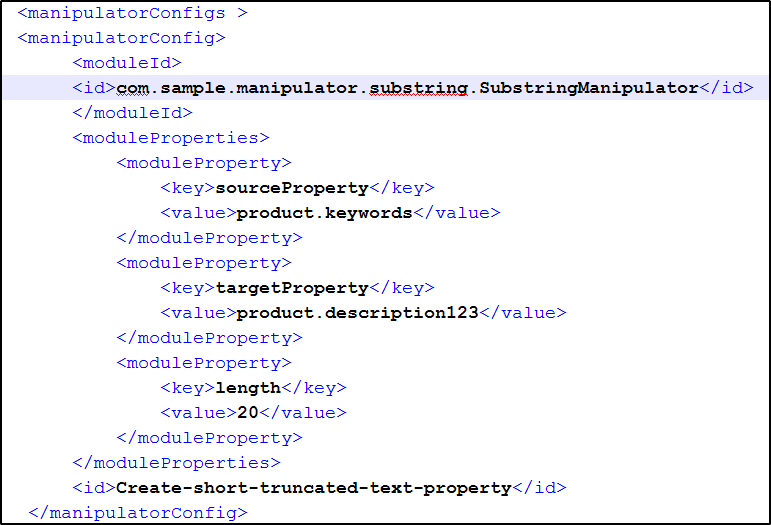 This Step can be optional if baseline triggers using /atg/commerce/endeca/index/ProductCatalogSimpleIndexingAdmin Component. 2. State files - Take the backup of <<Endeca_App>>/data/state folder and move state files copied from step-2 during export. 3. Endeca Pipeline - Take the backup of <<Endeca_App>>/config/pipeline folder and move pipeline files copied from step-3 during export. 4. Cartridge Templates - Copy cartridge_templates from step 4 and run the following command to apply to Workbench. 8. Promote Content - Run the following command to promote content from Authoring to Live. Promote content can be run the Workbench as well. Following Exception/Error comes during Endeca Application initialize services or baseline/partial indexing process. [04.20.16 22:46:54] SEVERE: Workbench login credentials are not found or found invalid credential type for key <ifcr> and mapName <endecaToolsAndFrameworks>. Please update using <ENDECA_TOOLS_ROOT>/credential_store/bin/manage_credentials script with '--type password' as argument. Please refer to script usage. [04.20.16 22:46:54] SEVERE: Failed to initialize IFCRUtility. [04.20.16 22:46:54] SEVERE: Caught an exception while invoking method 'run' on object 'InitialSetup'. Releasing locks. com.endeca.soleng.eac.toolkit.script.Script runBeanShellScript - Error executing valid BeanShell script. com.endeca.soleng.eac.toolkit.component.IFCRComponent initIFCR - Failed to initialize IFCRUtility. Above Exception comes as Endeca workbench password does not match with csfManager defined in WorkbenchConfig.xml. This happens if Endeca workbench password changed from change password screen and the same password not updated manually in CSF/OCS repository. Run the command manage_credentials.bat add --user admin --key ifcr under <<ToolsAndFrameworks_PATH>>/<<version>>/credential_store. - Update the password with workbench password. - When it prompts to overwrite, type yes. Oracle Endeca 11.1 onwards forge less approach is used to index. Most of the data manipulation is done at the source level. Java Manipulators required if some data manipulation required at CAS level. Find out the list of steps to create manipulator, deploy into CAS and use in the Endeca project. Create a Manipulator similar to as per sample provided by Oracle endeca. Sample can be found under <installpath>\CAS\version\sample\cas-extensions\src\main\com\endeca\cas\extension\sample\manipulator\substring. Create a jar file for classes created for the custom manipulator. Sample example gives ant script to create a jar file. Stop CAS service. Create a new folder under “<Installpath>\CAS\version\lib\cas-server-plugins. Place newly created jar and dependent jar to support manipulators under the newly created directory. As per above example file, a “targetProperty” has created as “product.description123”. Mapping needs to be added for newly created property to Endeca indexing. Run the following command to update configuration in Endeca configuration repository(ECR). Run baseline indexing process using App/control/./baseline_update.sh. Changes should be visible in endeca_jspref after indexing is done. Note :- Java Manipulators must be thread-safe. The CAS Server will invoke methods on this class from multiple-threads and potentially concurrently. Oracle Endeca 11.x - How to Add multiple record store using Endeca CAS ? Oracle Endeca has introduced forge less baseline indexing approach to index the data to MDEX engine. In this process, CAS generates the MDEX compatible data. Suppose there are requirements to add "content" from third-party and these data are different from products. In this case, another record store required for the new data source. Each Record under new record store should have "record.id" attribute. Endeca CAS uses record.id to make a switch join between multiple record store. The record would not be indexed if record.id is not available for any record. 1. Create a new record store - Navigate to CAS/bin folder and run ./component-manager-cmd.sh create-component -t RecordStore -n CRS_content. 2. Write data into record store using either CAS JAVA API or using XML file. 3. Add Record store entry in last-mile-crawl.xml. This file can find out under <<Endeca App>>/config/cas folder. 5. Run baseline indexing process. <[04.20.16 22:55:48] SEVERE: Unauthorized (401): Unauthorized access to workbench. Please check your credentials in WorkbenchConfig.xml/OCS. If problem still persists, please contact your administrator. [04.20.16 22:55:48] SEVERE: Caught an exception while invoking method 'run' on object 'InitialSetup'. Releasing locks. com.endeca.soleng.eac.toolkit.utility.IFCRUtility execute - Unauthorized (401): Unauthorized access to workbench. Please check your credentials in WorkbenchConfig.xml/OCS. If problem still persists, please contact your administrator. Above Exception comes as Endeca workbench password does not match with csfManager defined in WorkbenchConfig.xml. This happens if Endeca ifcr password is different than workbench password. Run the command manage_credentials.bat add --user admin --key ifcr under <<ToolsAndFrameworks_PATH>>/<<version>>/credential_store/bin. 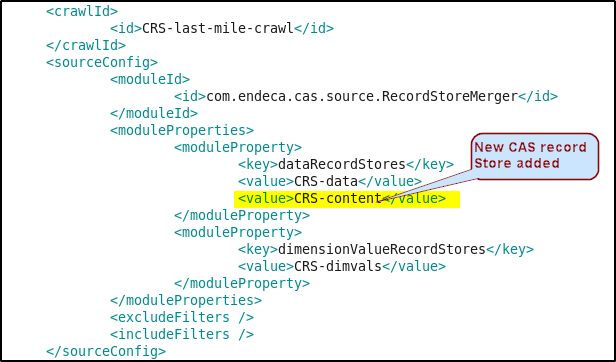 How to enable property for record filtering in Endeca - CAS based Indexing? The Index Configuration modifies index configuration stored in the Endeca Configuration Repository for an application. index-config.json contains all dimension and property definition including ATG configuration in ECR repository and used for indexing. This file can find out under <<Endeca_App>>/config/index-config folder. This file gets generated during application creation using deployment template. 1. Add a property in index-config.json under <<Endeca_App>>/config/index-config folder. 2. Add "isRecordFilterable" property as true. Below example would update product.brand property. 3. Run the following command to update the property in Endeca Configuration repository. <<Endeca_APP_PATH>>/control->./index_config_cmd.sh set-config -o all|system -f <<File_Path>>/index-config.json. Note : - By default Index-config.json contains few properties and those are not used in CRS integration. Remove all properties and add the desired properties. The Index Configuration modifies index configuration stored in the Endeca Configuration Repository for an application. This utility is typically used to modify data after it has been exported from a product catalog system and modify the search configuration settings for the data. Precedence rules. These are specified under the precedenceRules node. Search configuration. These are specified under the searchIndexConfig node. Optional. Indicates whether the property is processed by CAS when CAS writes MDEX-compatible output. A value of true includes the property during processing; false excludes the property. This setting is useful when troubleshooting data issues for specific attributes. If omitted, the default value is true. Optional. Indicates whether the property can be used to filter records. Record filtering presents a subset of the data to the end-user. If omitted, the default value is false. Optional. Specifies whether or not record search should be enabled for this property. Record search finds all records in an Endeca application that are tagged with an Endeca property that matches a term the user provides. You must enable each property that you want available for the record search. If omitted, the default value is false. Required. Specifies the trigger dimension for a precedence rule. How to migrate CAS record store schema with data between environments? As per ATG-Endeca Integration, All product catalog data gets stored in Endeca CAS record store during baseline process. Sometimes, these data needs to be migrated from Production to UAT or UAT to Dev. Find out steps below to Migrate. 1. Identify record store names to be migrated. Note :- CRS_en_schema is not used for CAS based Indexing after 11.1 version. How to retain selected dimension under multi select dimension on front-end? As per default behavior of Endeca, Selected dimension does not return as part of Endeca query guided navigation response whenever a multi-select dimension is selected. So selected dimension value does not get retained in left navigation. 1. Using Cartridges JSP - This approach can display selected dimensions in either top or bottom of the selected dimensions, not in the order that was being displayed. Get ENEQueryResults.getNavigation().getDescriptorDimensions() to get the selected refinements. Get RefinementMenuConfig object to get the dimension order that defined in Endeca Experience manager boosted or buried section. Merge the OOTB RefinementMenu object under process() method using step 1 and 2 objects. 3. Disabled Dimension - Click here to view. Endeca provides out of the box configuration for generating SEO specific URL. Below configuration needs to be set properly to enable ATG/Endeca SEO integration. 1. Set urlFormatter=/atg/spring/FromSpring/seoUrlFormatter in /atg/endeca/assembler/cartridge/manager/NavigationStateBuilder/ component to enable SEO URL. 2. 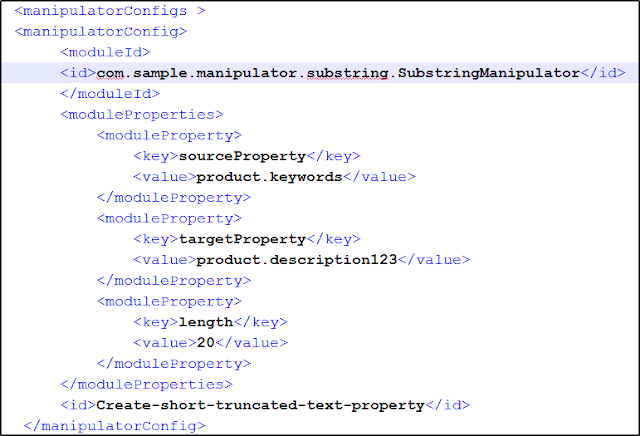 Configure "seoUrlFormatter" bean object with different properties in endeca-seo-url-config.xml as per need. <!-- BEAN: seoUrlFormatter This is the top-level URL formatter. 4. Enable N-value Encoding as per below screenshot. This setting would convert long format N-value to Encoded Format. 5. Set dimension formatter under dimLocationFormatters. This is a list of dimensions value that can be part of URL. dimLocationFormatters get sets under navStateFormatter. Note : User aggrERecFormatter for Aggregate/Rollup Query and erecFormatter for Record Details page. Example - Suppose BrandFormatters added here and User selects any brand from guided navigation, Brand name would start coming on SEO URL. Endeca Application is created using deployment template available under ToolsandFramework. Do not delete the application directory before removing to Endeca Application from EAC. Run eaccmd.sh list-apps from any directory. Execute step-1 once again to verify if the application has been removed successfully or not. 2. Go to apps directory and delete application directory. Note : Removing application does not remove DimensionValueIdManager and record store. Find out the screen shot below. 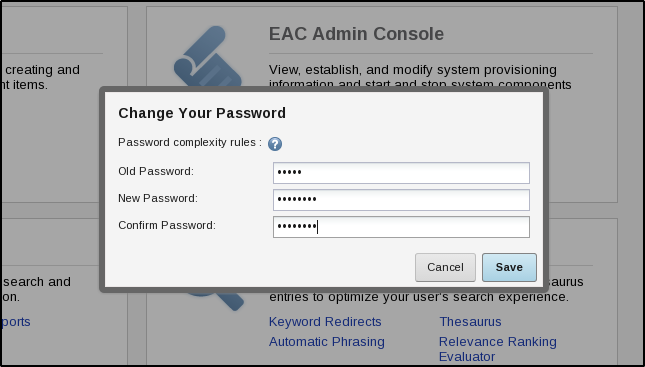 How to Update EAC after updating Endeca Application Configuration? Endeca Application Configuration is set using AppConfig.xml and available under <<Endeca_App>>/config/script. AppConfig.xml is devided into multiple files and added as different xml under same folder. 1. Navigate to <<Endeca_App>>/config/script folder. 3. Run ./runcommand.sh --update-definition under control folder and the following output can be seen. [04.19.16 14:31:09] INFO: Checking definition from AppConfig.xml against existing EAC provisioning. [04.19.16 14:31:10] INFO: Updating definitions for dgraphs in restart group '1'. [04.19.16 14:31:10] INFO: Stopping component 'DgraphA1'. [04.19.16 14:31:12] INFO: Updating definition for component 'DgraphA1'. [04.19.16 14:31:16] INFO: [LiveMDEXHostA] Starting component 'DgraphA1'. [04.19.16 14:31:37] INFO: Definition updated. How to Handle invalid record during baseline CAS record store update from ATG? The /atg/endeca/index/commerce/ProductCatalogSimpleIndexingAdmin component triggers baseline indexing. As part of baseline process, ATG pushes product data to Endeca record store. Invalid records are records with missing IDs (either the idPropertyName property is missing or it has a null value) or with invalid action types for the Endeca.Action property. Add <ignoreInvalidRecords>true</ignoreInvalidRecords> into record store configuration and save. Was this post help you to resolve the issue that you are looking for? Any other issues that you might have and need a solution? Click here for more ATG-Endeca Integration related issue. The Record Spotlight cartridge handler can promote either specific records or a set of dynamic records based on a navigation state. 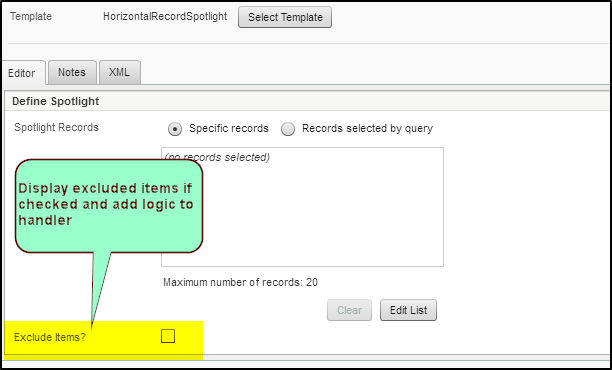 RecordSpotlightHandler provides functionality to add any static record filter OOTBs and can be setup using recordFilterBuilders properties. What if some dynamic record filters need to be applied to get featured record or recommendation. Example : Show 10 featured product excluding the current brand selection by the user. Extend RecordSpotlightHandler that implements dynamic filtering based on previous request or profile. // Update the record filter list with RecordFilters generated by the RecordFilterBuilders. Was this post resolve the solution you are looking for? what do you think about this solution? 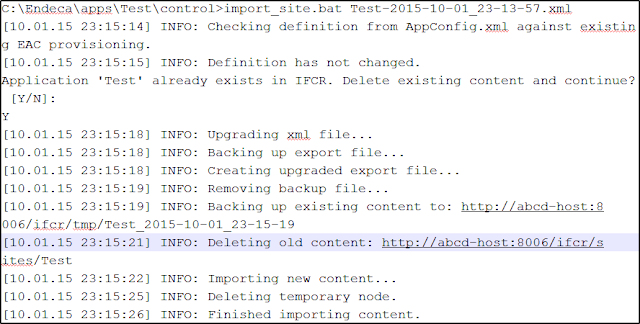 Endeca Application : How to remove host entry from AppConfig files and EAC? 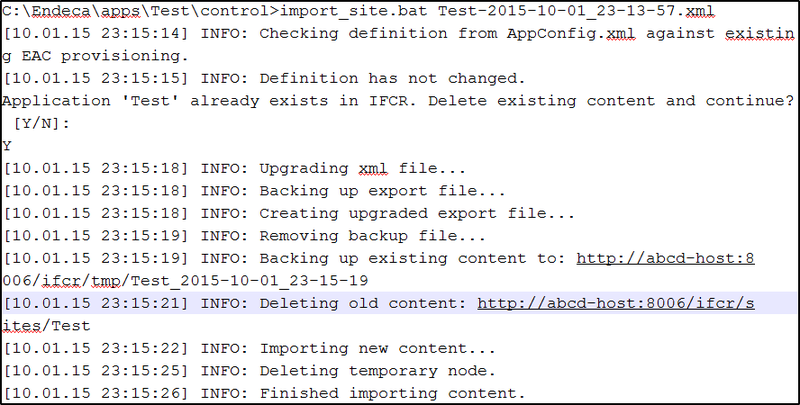 AppConfig.xml import set of XML files related to host configuration, process definition etc. LiveDgraphCluster.xml contains host and port entry related to multiple Dgraph and this file is the potential candidate to add/remove host entry. Suppose one new MDEX host added as per need basis and after sometimes extra MDEX host needs to be removed from LiveDgraphCluster.xml. Run below command. This command does not remove any host from EAC. --update-definition can only add Dgraphs and MDEXHosts by updating the LiveDgraphCluster.xml but not remove it. Endeca Url configuration is managed in endeca-seo-url-config.xml. SeoUrlFormatter class generates the SEO URL for refinements or landing pages. Canonicalization is the process of picking the best/one URL when there are several choices. User is on Category landing page and clicked on brand "Adidas" than Brand "Element", Another user clicked on Brand "Element" than Brand "Adidas" for same Category landing page. As per URL canonicalization, only one URL should be generated, regardless of selection path. Any crawlers would treat both URLs as different URL even product records are same and this might lower down page ranking. How to setup URL canonicalization? Once above setting is applied, the example above will generate only one URL regardless of traverse path. Note :- Enabling canonicalization impacts the breadcrumb orders.